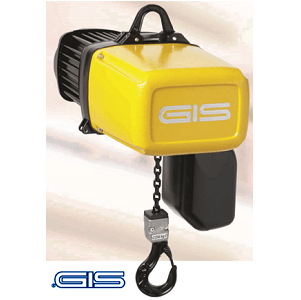 The latest electric hoist from GIS available now from Lifting Hoists Direct. The GIS GP electric hoist range can be customized to suit special applications. 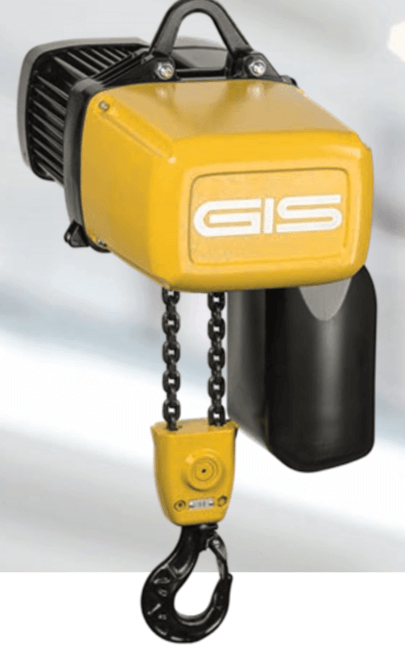 GIS GP electric hoists are the latest range from leading hoist manufacturer GIS. After extensive research and design the GP range went into production in January 2017 and will eventually supersede older models. 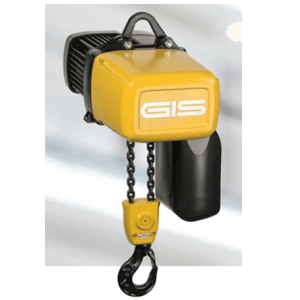 The GIS GP electric hoist system has many advantages; it is currently only available with 250kg & 500kg lifting capacities though this will be expanding very soon. 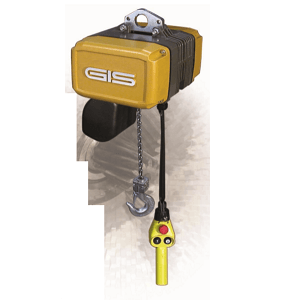 The GP range is using all the latest technological information, design techniques and component materials you can be assured of an electric hoist which will last well into the future. What’s more the GP range has a multitude of special models for specific applications. 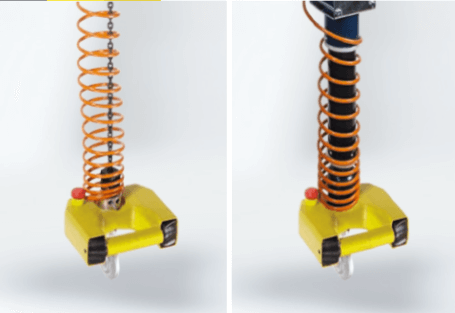 You can find out about the GP special products range here; this page concentrates on the standard GIS GP electric hoist. The GP system is the all round endurance hoist, safe, reliable and easy to operate, maintain and repair, this long lasting hoist has many customer specific options and extras too. The 3 year warranty ensures customer satisfaction. Here we will look at the main components of the hoist, clutch, chain guide, controls and transmission. 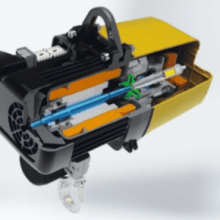 SLIP CLUTCH: This slip clutch provide the overload protection for the hoist, it will help to protect the motor and crane system in the event of an overload situation. 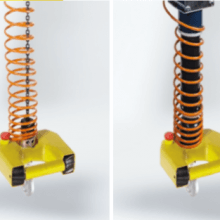 The slip clutch on the GP electric hoists is easy to access as it is located before/in front of the brake but outside the flow of forces and will run dry with little maintenance needed. Adjustments to the clutch are relatively straight forward due to its convenient placement. TRANSMISSION: The GP has a 3 stage transmission system with helical gearing; this also has the added benefit of lifetime lubrication for maintenance free smooth operation. 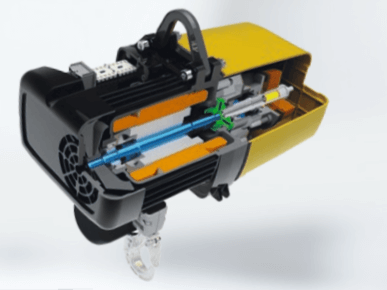 The gearbox itself is enclosed and self-contained which enables quick and clean replacement, should a different gearbox with a different operating speed be needed. This could have a big impact on its cost effectiveness to, as a gearbox is cheaper than a complete hoist. This is an ideal system should you need a hoist fit for different lifting operations. CHAIN & CHAIN GUIDE: The manganese phosphate profile steel chain increases its service life and improves its dry running properties. It has a larger cross section to reduce wear & increase its working life. It has a minimum 8-fold safety factor (1 fall, FEM 2m, ISO M5). The chain guide is easy to disassemble should the need arise. Both the chain and guide are wearing parts and so should be checked on a regular basis and replaced if necessary. BRAKE: The system incorporates a spring loaded brake with a low wear DC spring. CONTROLS: Ergonomic in design, the hand held controller is comfortable to handle and operates at a low 42v. The parallel push buttons aid the ease of use. OPERATION: These hoists are easy to use and operate, the compact housing and low dead weight means it can be set up in the tightest of spaces easily. The controller incorporates and emergency stop button, to cut the power immediately should the need arise. This is a fairly quiet hoist which runs smoothly and efficiently all the time. 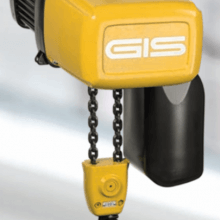 Overall the GIS GP electric hoist system is simplistic in design with no complicated and sensitive electrics in order to minimise operational disruptions. Polygonal connectors are used in the shaft-hub connections within the housing; this aids faster disassembly when required. The GP electric hoist has an IP65 protection class rating which shows it is protected against dust ingress and water jets. 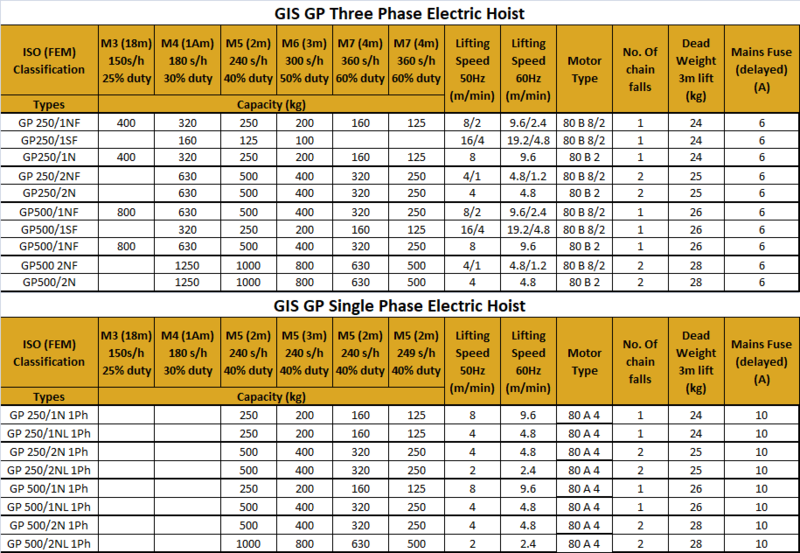 There are a good range of options for the customer to choose from on the GP hoist; single or three phase power; various operating voltages; hook or eye bolt suspension points; lifting heights (up to 200m) upper and lower hook path position adjusting options; temperature monitoring; data counting; special speeds; direct or radio controller, frequency inverter. The GP range of electric hoists are suitable for use in numerous areas such as automotive, agriculture, transport, gas, logistics, steel, engineering and many more. The modular design means that servicing and repairs can be carried out quickly and easily. Contact the sales team at Lifting Hoists Direct to discuss your specific needs.